The APS Conferences for Undergraduate Women in Physics (CUWiP) are three-day regional conferences for undergraduate physics majors. The 2019 conferences will be held January 18-20. 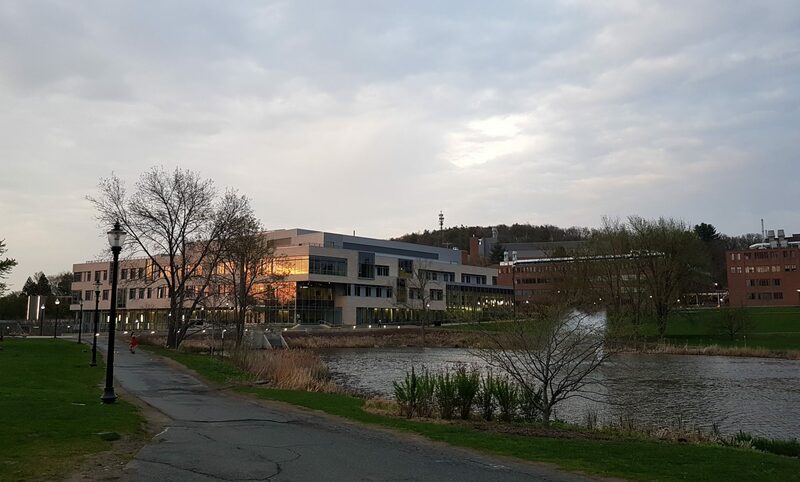 The 2019 program at the University of Massachusetts at Amherst will include research talks, panel discussions about graduate school and careers in physics, workshops, and discussions about women in physics, student research talks and poster session, and laboratory tours. Any undergraduate student with an interest in physics may apply to attend a CUWiP. For the last decade, Conferences for Undergraduate Women in Physics (CUWiP) has helped undergraduate women thrive in physics by providing them a with a unique opportunity to engage with and learn from other women in physics at all stages of their physics careers. At CUWiP, budding physicists will experience a professional conference, learn about graduate school and professions in physics, and share invaluable experiences, advice, and ideas with other women. We encourage non-undergraduate students or interested faculty/mentors, particularly those who plan to accompany undergraduate students from their institutions, to fill out this form as well as email cuwip@umass.edu for details about attendance and participation. Are undergraduate physics or engineering physics majors. Have never attended an APS CUWiP. There is no formal registration process for non-undergraduate students and interested faculty/mentors, but interested individuals should fill out this form. No. You apply to attend a CUWiP conference (the one closest to you), and you are accepted, wait-listed or declined according to the priorities listed above. The application is free, and the deadline is Friday, October 12, 2019, at midnight ET. After you have been accepted, you then you register to attend the conference to which you have been accepted (you may be assigned to a different conference depending on the number of applications) to confirm that you will actually be attending. There is a one-time registration fee of $45, which helps offset some of the cost of the conference, including all lodging and meals. Please apply to the site in the region that is closest to you at the time of the CUWiP using the APS CUWiP map as a guide. Lodging (for non-local students) and food will be covered by the conference; you do not need to pay for your hotel room or food at the conference. We expect that your travel expenses will be covered by your home department or college. However, if they are not able to cover these expenses, travel funding may be requested by contacting cuwip@umass.edu. UMass students living on campus may move in early on Friday, the early move-in fees will be covered. Please talk to your department chair, manager, or director of undergraduate studies before registering for CUWiP. You might ask an academic advisor, faculty member you know, or other mentors for guidance about who to ask if you are unsure. You can also contact us if you would like guidance in asking your department for travel funds. Can I attend the UMass CUWiP even though it is not my closest location? For example, I am considering UMass for grad school and would like to visit the school? Students from Canada are encouraged to apply to the Canadian site at Queens University. Students from Canada may apply to closer U.S. sites if desired. However, Canadian students accepted to U.S. sites are not eligible for reimbursement of travel expenses from the conference or for waiver of the registration fee. APS is only able to fund students attending universities in the U.S. We welcome students attending non-U.S. institutions to email our site at cuwip@umass.edu or another CUWiP site to ask if you can apply to attend. CUWiP sites will not be able to reimburse students attending non-U.S. institutions for accommodations or travel. Only undergraduate students who will be over 18 at the time of the conference may apply to CUWiP. Please contact us at cuwip@umass.edu if you are under 18 years of age at the time of the conference. Yes, students of all genders are welcome to attend this conference. If you have questions or concerns about the housing for this conference, please contact us at cuwip@umass.edu. Students are responsible for arranging their own travel to the conference. We encourage students to coordinate with other attendees from their institution. Please be in communication with your local chair or faculty member if your department is reimbursing you for travel costs. If your department cannot fund your travel, please communicate with cuwip@umass.edu for plane and train ticket approval before purchase. Please visit our Travel page for more information. Do not make your own hotel reservations. We will help you with travel between airports and UMass Amherst, by organizing shuttles or pointing you to commercial services. If you plan to fly, please contact us at cuwip@umass.edu before making your reservation. More information regarding transportation is available here. If you are being reimbursed by the conference (rather than by your department): after the conference, you can submit the reimbursement form that will be provided to you. Reimbursement will be mailed to you within the month. For more details please contact us. Keep in mind your travel agenda and cost must be approved by the conference organizers before you book your travel. The conference has no dress code, and we encourage students to be comfortable. It will be cold and snowy in January so please bring warm clothes accordingly. Yes! We have set up a Facebook page you can check-out! I have anxiety/depression regarding my arrival? am worried about attending this conference. What should I do? Please contact us if you are comfortable so we are aware at cuwip@umass.edu. We will encourage you to try your best during the networking opportunities, but if you need to be paired up with someone you know (either in rooming or meals), please let us know so we can try to accommodate you. We hope that you will be able to comfortably attend the conference and get something from it, but we understand that everyone needs to go at their own pace. Why does CUWiP ask for my pronouns? Why should I consider putting them on my name badge? CUWiP seeks to be a safe space for all participants. By asking for pronouns, we are ensuring that we don’t accidentally misgender any of our participants or make harmful assumptions based off of appearance. Even if you have never considered this in relation to yourself, by including your pronouns on your name badge you can help to make other CUWiP participants comfortable. We hope you will consider this.